Thanks for stopping by, I hope you've been having a great weekend! Here's what I created using MJ's TechnoStamper Sketch Challenge. Sorry about the bit of shadow over the sentiment the bow was blocking my light - it reads Birthday Wishes and is from the Simple Sentiment set at Kitchen Sink Stamps. 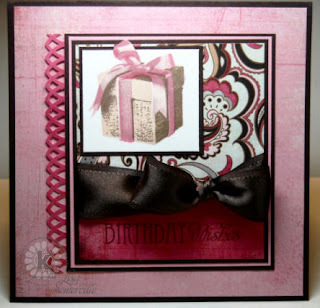 For the focal image I used the Multi Step Gift stamping the gift our in backwards order #4 Memento Rich Cocoa, #3 SU Soft Suede, #2 Memento Desert Sand, #1 Memento Desert Sand, and the ribbon, also our of order: #Regal Rose, #2 Pretty in Pink, #1 Pink Pirouette, #4 Regal Rose. I chose my colors from the beautiful Basic Grey Bittersweet Papers that I used on this card. Be sure to stop back tomorrow for Kitchen Sink Stamps Monday - I've created an altered jewelry piece to share with you! ?for me? It's a beautiful gift! oh my gosh that present looks so real. Love the colors, that bow is beautiful. Lisa, love the paper (he he) and the silk bow is gorgeous with the present. Great card Lisa! Love the color combo. What beautiful colors for this gorgeous birthday card, Lisa! Awesome layout! Love it! What a beautifully wrapped gift, these stamps are so cool how they look so real. Thanks for playing along. Whoa Ho...on bittersweet Bacic Grey...everything ties in so well with the image...awesome.